This article is about the social space in Destiny. For the area in the Destiny 2 expansion Curse of Osiris, see The Lighthouse (Destiny 2). "Only true champions of the Crucible dare set foot in these fabled halls." 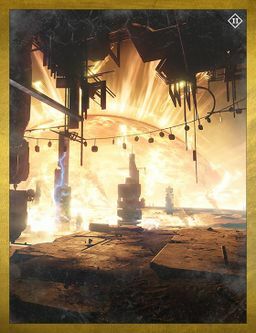 The Lighthouse is a social space maintained by the Cult of Osiris located on Mercury that is only accessible by achieving a "Flawless Victory" of 9 wins and 0 losses in the Trials of Osiris elimination Crucible mode. The Lighthouse is a small Vex structure that was deserted for unknown reasons. The area is currently being maintained as an outpost by Osiris's extremely secretive network of disciples. The main point of interest is a large loot chest at the structure's far end that can potentially drop unique Trials of Osiris-themed gear, Etheric Light, Passage Coins, Motes of Light, and Exotic weapons and gear. There are also large deposits of glimmer, abandoned weapons and gear, as well as a dormant ship. Both the can freely leave and return to the Lighthouse at any time until the weekly reset. A team of Guardians working for New Monarchy explored the Lighthouse, but found it to be unsettling, as the Vex influence was still strong and created a sense of deja vu. At one stage in development, the Lighthouse was named the "Halls of Amentet". Players can also enter a small campsite hidden within the depths of the Lighthouse. There are a few human skeletons with Auto Rifles strewn about, as well as a dead Goblin. The campsite contains no additional rewards other than the large chest. The Lighthouse was originally intended to appear in the original storyline of Destiny. Here, it was a Vex temple where players would encounter Osiris. A Hawk can be found inside. Destination Menu View from Destiny Year One. A section of the Lighthouse filled with unused candles during the 2016 Festival of the Lost.